After a deep research of features and requests of fire alarm system and security system to ‘three types of small place” by SANJIANG, a fire alarm system and security system solution based on wireless fire monitor and alarm system has been developed directionally. This solution has a lot of features such as easy installing, stable and reliable system, multi-touch and intelligent supervision. The system can achieve many innovation functions such as intelligent fire alarm, burglar alarm, linkage of video surveillance in real time, smart cloud platform, centralized management control. SIM card is supported to communicate with “SANJIANG smart safety cloud” in real time and push the warning information including fire alarm and fault to the application of phone, community fire station, community police station and peace city control center etc. timely. This solution can identify and eliminate hidden danger rapidly and efficiently, and it can be widely used in all kinds of “ three types of small place” and family house. 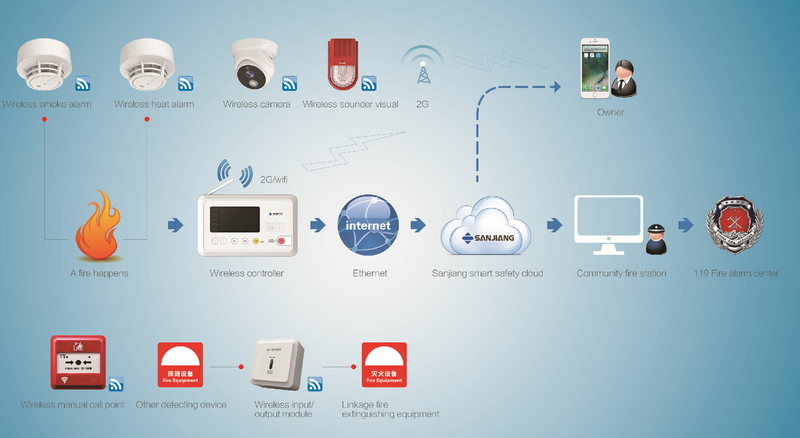 The wireless fire monitor and alarm system of SANJIANG is composed of four layers: leading end network layer, remote management layer, terminal application layer and community supervision layer. The leading end network layer is a wireless LAN and composed of wireless smoke alarm, wireless heat alarm, wireless sounder visual, wireless manual call point and I/O module which can gather the information of smoke concentration and temperature, analyze the information preliminarily and upload the information to the platform. The remote management layer adopts smart cloud management platform. By network receiving, storing and analyzing the sensor information from the front-end device, the platform can transmit the information by wifi or 2G network to community management platform and push the equipment failure and maintenance information to operation service provider. The terminal application layer can receive the fire alarm and safety alarm information in real time, analyze and call the police (by phone or text message) by mobile phone, tablet, mobile terminals, etc. The community supervision layer can receive the fire alarm and safety information which is transmitted from smart cloud management platform by network and organize the police to handle the emergencies. l Linking with community fire station and local police station closely, fire alarm and security alarm can provide double security guarantee.